This is the second of four posts about the farm accounts from Blackhall that covered the years 1863 to 1865. This post is about the household expenses for Thomas Smith at Blackhall when he started to lease the house and farmland in April 1863. I found it very interesting to get a glimpse of how Thomas Smith lived in the first couple of years of his tenancy at Blackhall: what kinds of furniture he bought for the house, what foods he ate, what kinds of clothing he bought and what kinds of equipment, animal feed and other products he bought for the farm. 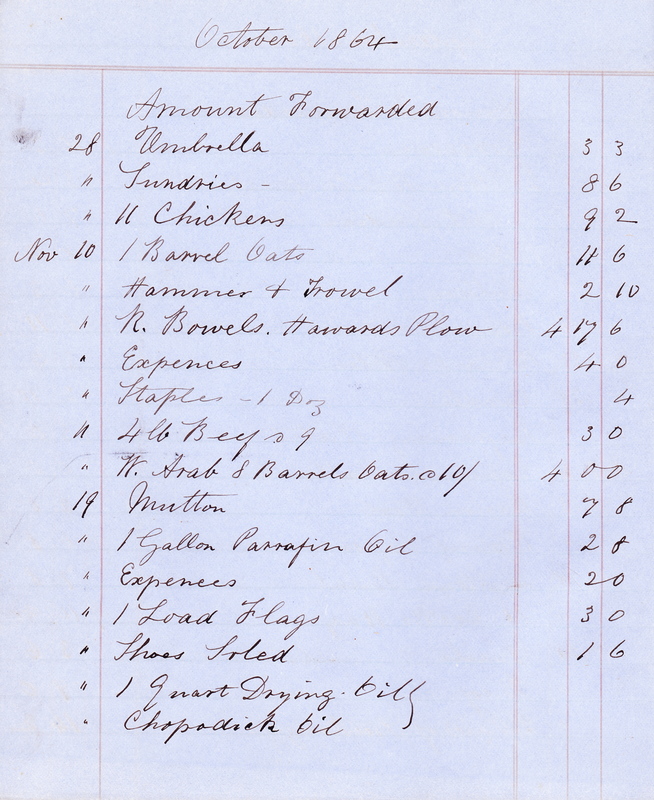 In 1863, starting on March 14 and going to the end of December, the household expenses at Blackhall totaled £465 9s 10d. 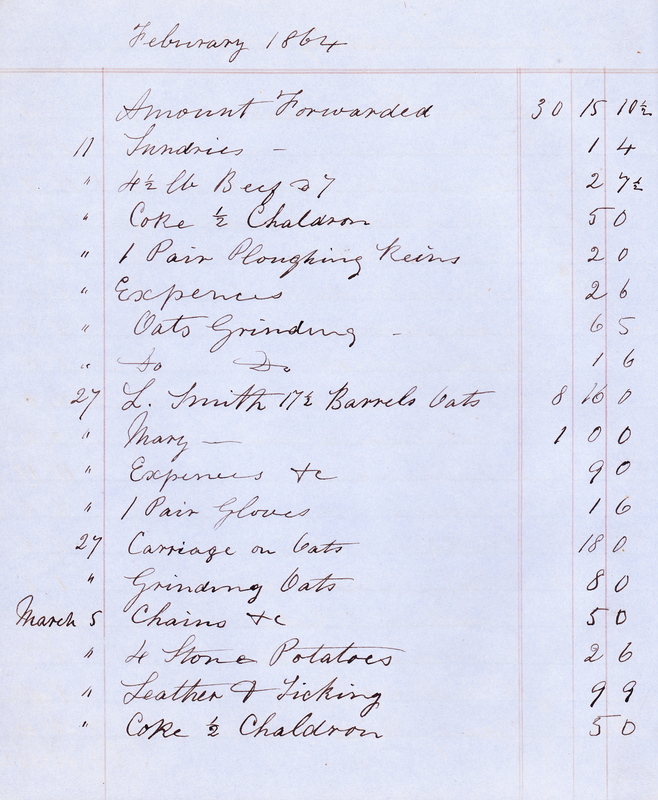 These expenses included everything from furniture to food and clothing as well as the cost of hay and farm implements. His household expenses could be expected to be higher in the first year as he had to acquire furniture and other goods needed for the house that would not be bought every year. The equivalent expenses for the full year in 1864 were £419 15s 0½d so that was much lower per month. As explained in the first post on this topic, the current value of these expenditures in today’s money is about 75 times as high. So, for example, the 1864 expenses were about £31,500 in today’s terms. I have found it interesting to see what entries were made in the household accounts and how the items for the house were mixed in with items for the farm operations. It is quite usual to see, for example, an entry for two loads of gravel, followed by groceries, some velvet, a pipe of wine and 21 pounds of beef. Sometimes items that should have been in the livestock section (the cost of carriage for cattle that had been bought) or in the farm labour section (hiring of a ploughman) were listed in the household accounts. 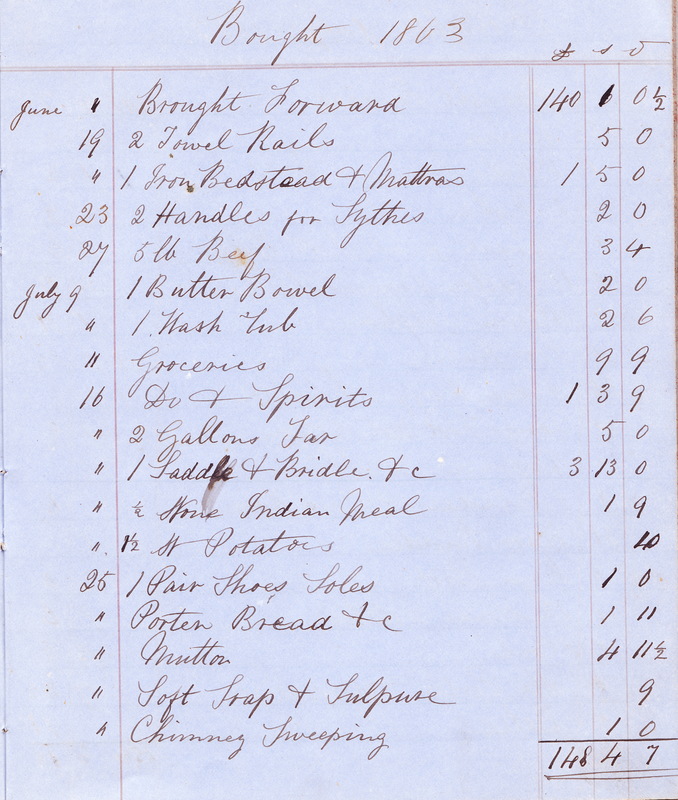 Periodically, throughout the household expenses sections, there are entries of “sundries” and “expenses”, some of which are marked as related to traveling to Dublin. I assume most of these expenses were related to travelling to and from livestock sales. 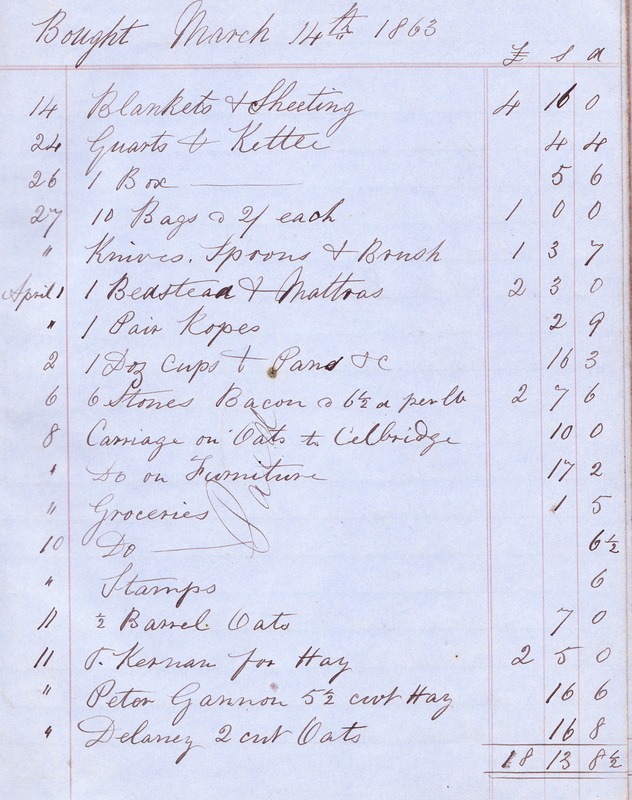 On 4 October 1864, the entry was for “expenses Ballinasloe” so Thomas was traveling farther afield to Galway by then. The Ballinasloe horse fair always takes place in October so that was probably where he was going. 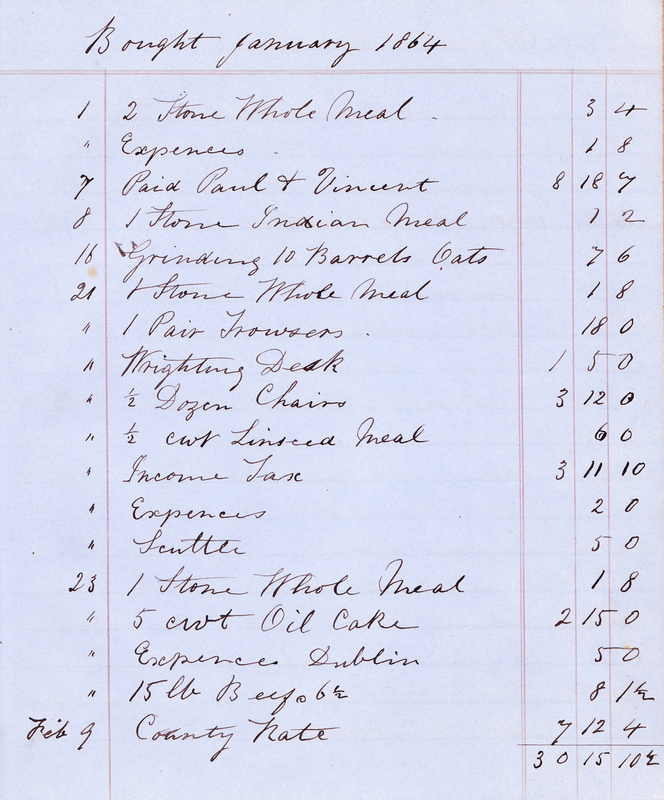 Following are a few excerpts from the household accounts to give you some idea of what was bought in 1863 and 1864. 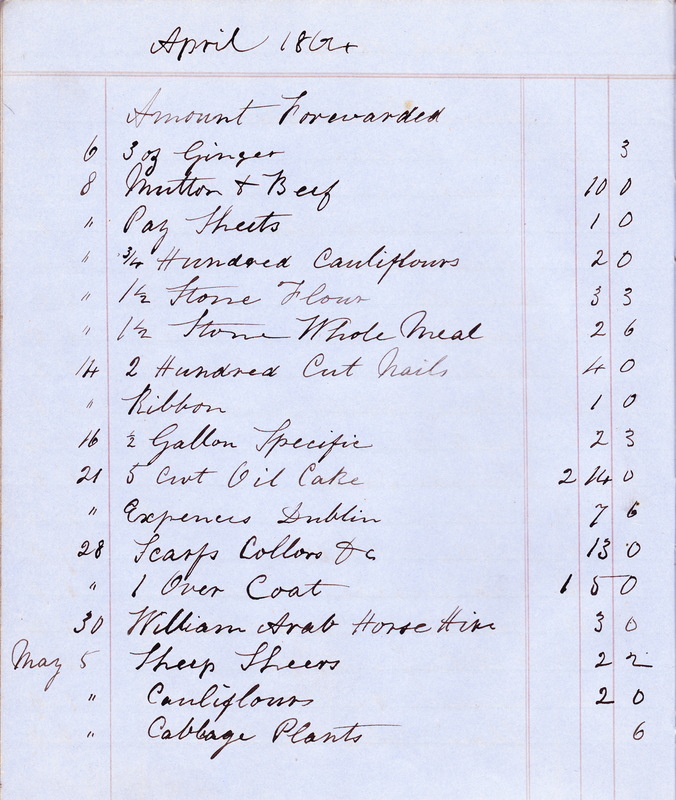 On 14 March 1863 (even before he had moved in to Blackhall), Thomas started to acquire some basic furniture. The expenses began with basic necessities of blankets and sheeting, a kettle, some cutlery, cups and pans, and a bedstead and mattress. The cost of having some furniture delivered was also included. The purchase of 6 stone (84 lbs.) of bacon looks like a good start for many a breakfast. On 16 April, Thomas bought some more furniture at an auction at Blackhall (presumably the household effects of the previous tenant). On 17 April, he started hiring a horse from W. Arabb (also written as William Arab in later entries) and continued doing this occasionally over the two years recorded. Looking at the livestock bought listings, there were two horses bought on April 7 – a mare named Peg and a horse named Harper. On 16 April, he bought two sets of harness. Also on 16 April, there is a substantial payment to Messrs Paul & Vincent of £36 9s 7d. This is a firm of livestock feed merchants that still exists today. There were a number of payments to Paul & Vincent in the accounts. On 30 May, the cost of getting the lease was paid: £13. Also on 30 May, more household goods were bought: a couch, carpet and blinds, a smoothing iron, a fender and fire irons, a bucket and 3 kitchen chairs, all for £4 11s 3d. 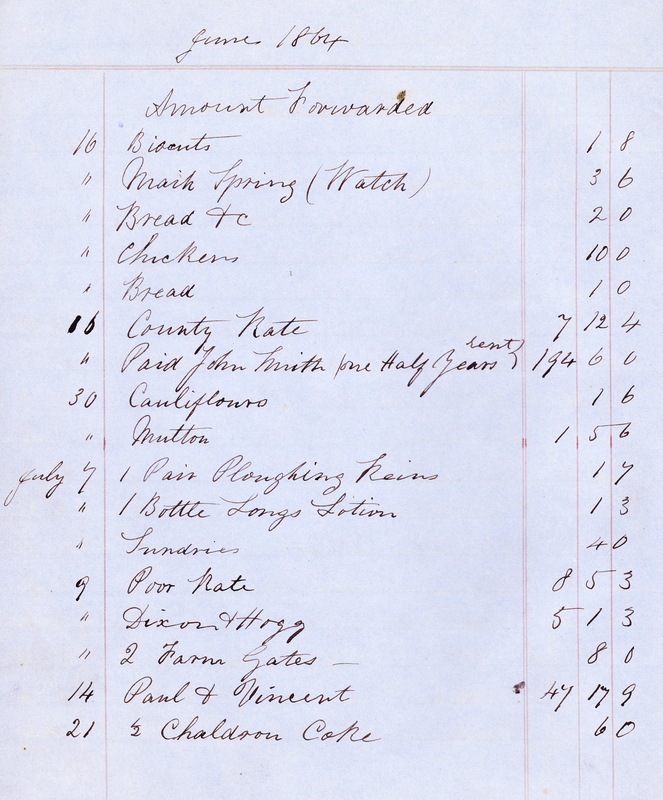 In June, there were purchases of a number of hay rakes and some tumblers and wines as well as spirits and porter. I don’t know what an “American rake” was but it was significantly more expensive than the regular hay rakes. I was a bit surprised at the various purchases of alcohol since Thomas was the son of a staunch Methodist family. These purchases are listed along with entries about groceries, hardware, collars and a neck tie. Thomas was still buying household furniture on 19 June when he bought a hall stand, a dressing table and stand, two towel rails, an iron bedstead and a mattress. On 9 July, Thomas bought a butter bowl and a washtub; on 16 July he bought a saddle and bridle. For a cost of one shilling, he had the chimney swept on 25 July. On 1 November, Thomas bought 13 ducks from Mrs. Ganor for 10 shillings. On 17 November, he bought a gig from Mrs. Galagher for £5 and on 3 December he bought a rug for the gig. Again on the same date, Thomas paid John Smyth £12 for the wheat that was growing at Blackhall – presumably this had been sown by the previous tenant. On 21 January, Thomas was quite busy: he bought a pair of trousers, a writing desk and 6 chairs and a coal scuttle as well as paying his income tax (£3 11s 10d). On 9 February, he paid the County Rate. That was £7 12s 4d – more than double the income tax rate. On 11 February and again on 5 March, Thomas bought “Coke ½ chaldron”. Coke referred to fuel for a stove of some kind; but I was mystified by what a chaldron was. I have since learned it is an obsolete measure formerly used to measure the weight of a load of coal or coke. There was no standard weight equivalent for a chaldron – that is probably why it stopped being used. On 27 February, Thomas bought 17½ barrels of oats from “L Smith” – almost certainly his brother Lancelot. His sister Mary Smith was given £1; the entry does not say what this was for. 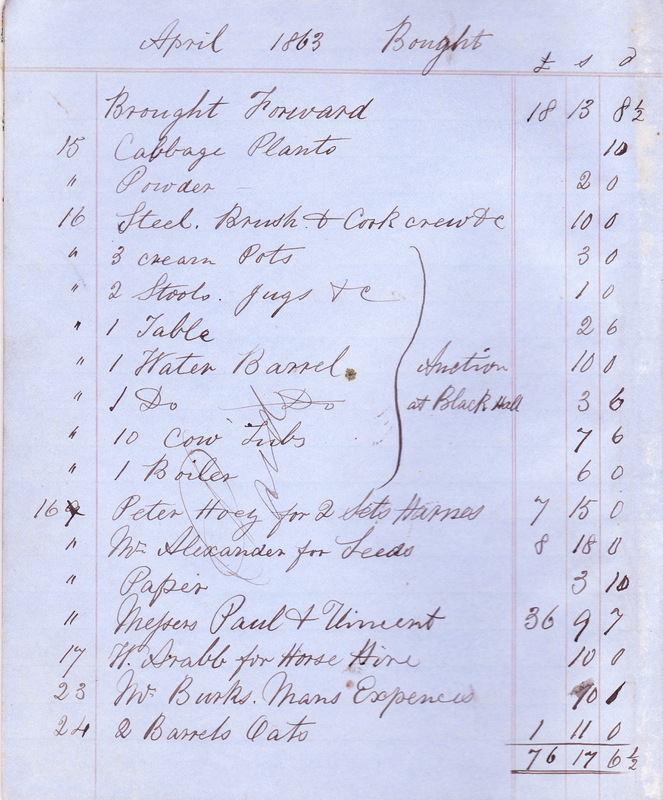 On 8 April, Thomas bought “pay sheets”, which I assume he used to record his payments to the farm labourers. 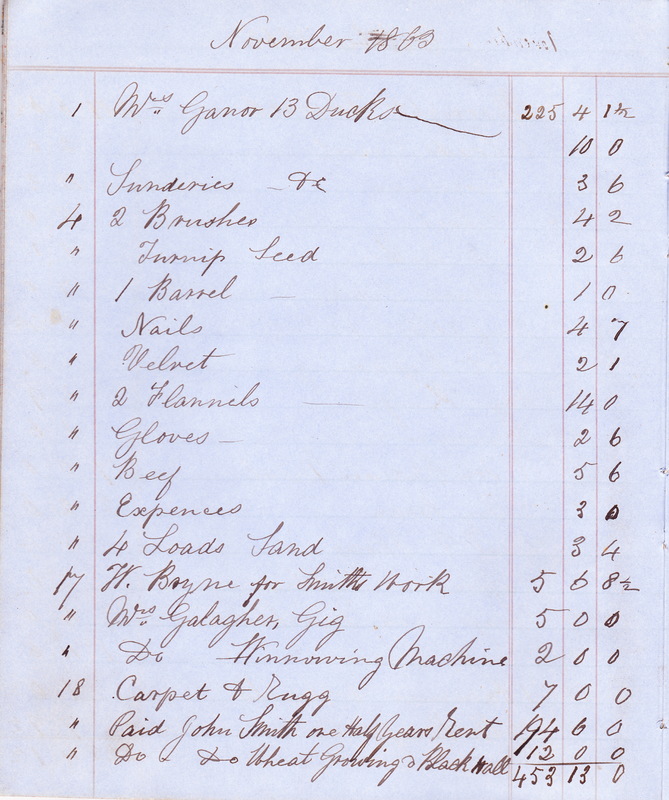 There is nothing in the accounts book about the farm labour expenses for 1864 although a few months of 1865 are covered. On 16 June 1864, another half-year’s rent was paid to William Murphy’s agent, John Smyth. The other half of the annual rent for 1864 is not recorded in the accounts so one wonders how complete they are. Also on 16 June, Thomas paid the County Rate of £7 12s 4d. On 9 July he paid the Poor Rate of £8 5s 3d. On the same date, Dixon & Hogg were paid £5 1s 3d; I don’t know who they were but later in the year Thomas bought some sheep nets from the same company. Two farm gates were bought, also on 9 July, for 4 shillings each. Then there was another large bill from the feed merchants, Paul & Vincent. Thomas seems to have had a lot of trouble with his watch: on 16 June, the mainspring was replaced; on 5 September, he bought a watch guard; and on 29 September he had the watch repaired again. On 28 October, Thomas bought an umbrella and 11 chickens. I assume the chickens were for egg production, not for immediate eating. He was still buying meat (beef and mutton) from other people although the farm probably supplied some of its own meat to the household. 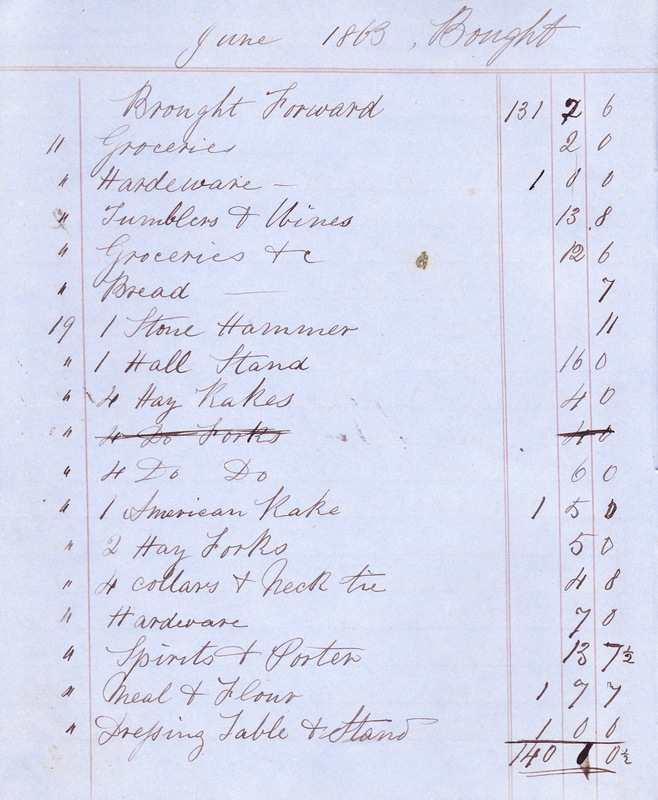 On 10 November he paid R. Bowels for a “Howard’s Plow”. As explained below, I do not think he bought such a plough, especially not for such a small amount of money. I was curious as to what this plough was. Apparently, this was a steam-driven ploughing machine with a single engine and two winding drums with about 550 yards (or 500 metres) of wire rope attached. The plough was attached to the wire rope and pulled back and forth across the field. No horses were required to pull the plough. From what I have read on the internet, this particular ploughing machine was invented in England in the 1850s by J & F Howard of Bedford. Again according to what I have read, the ploughing machine required 4 or 5 men and a boy to operate it so I think Thomas rented the use of the machine and its crew from a steam ploughing contractor for maybe one or two days. I wonder if he tried the same method of ploughing in later years.